We are St. Louis Wildlife, Inc. a full-service wildlife removal company servicing the greater Saint Louis MO area. We resolve conflicts with unwanted birds. - Pigeon prevention on buildings, ledges, signs, etc. - Removal of bird inside buildings, warehouses, etc. When Can You Solve My Pigeon and Bird Problem? 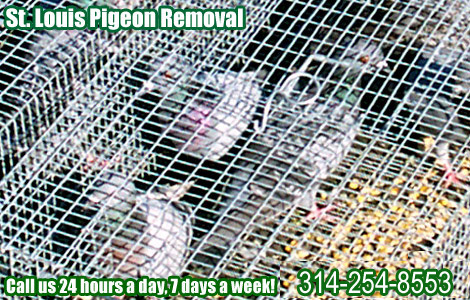 Our company specializes in wild animal control, including St. Louis bird removal. Common problems caused by bird include: nesting and roosting on buildings, inside buildings, loose birds inside commercial spaces and stores, and bird waste on public areas causing contamination. How To Deal With Pigeons In Warehouses - Pigeons can be a major nuisance. Their droppings are not just unpleasant to the eye, but they can also damage properties and goods, and they may carry diseases. When dealing with pigeons in warehouses, you will need to be aware of the resilient nature of these birds. They usually stick to one place they find favorable for their nests and they return there over and over again, no matter how many repellants you use. It can be quite a daunting task to try to get rid of them, since they are so bound to never part with your property. One reason why pigeons in warehouses constitute a major source of distress is that their urine and droppings can get on the goods stored inside. For a business, it would be a hardship to sell damaged merchandise once it was contaminated in this manner. A methods widely used to get rid of these birds is to destroy their nests, but actually, this is not a very efficient method, since the pigeons have no trouble getting back to the same place and build new nests once more. They can be removed via trapping, netting, shooting, or even falconry! A better solution might be to try to keep them away from the building in the first place, although it involves a bit of expense, is to deal with shock tracks, needle strips and covering any areas where they can enter the building. Getting Rid Of Pigeons In Attics, Walls And Ceilings - At first glance, pigeons seem like very friendly birds. However, despite their calm demeanor, these birds can cause a lot of damage, especially to private properties, as they tend to remain in the same place for long periods of time. Since they are used to living in packs, their number can increase tremendously, and lead to a large population of birds that will be hard to keep at bay. You may even find pigeons in walls and ceilings, as they tend to make their nests on roofs or right under the rooftop. Here is where they raise their young, eat and of course, relieve themselves, causing plenty of nuisance and damage. Various methods can be tried to remove pigeons in walls and ceilings. Do-it-yourself methods include the use of repellants, noises, lights, or even poison. However, the bad part of these methods is that they very rarely work and, even when they do, they do not manage to keep pigeons away for too long. Poisoning is a bad solution, especially, since dead birds can become a source of disease on your property, especially if you have pets. Your best method is to seal off any entrances they use to get in with wire or metal plating. You can also use needle strips and shock tracks to keep them from landing.